23 1/2 x 18 in. James Cohan will present BEST LIFE, an exhibition of new paintings and drawings by Grace Weaver at the gallery’s Lower East Side location from September 14 through October 28. This is Weaver’s first solo exhibition at James Cohan. The gallery will host an opening reception with the artist on Friday, September 14, from 6-8 PM. Grace Weaver’s paintings depict an atmospheric and accessible world drawn from the everyday past-times of modern American life. 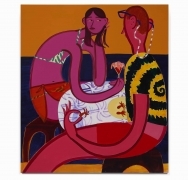 Touching upon diverse influences—from the concise brushwork of Bengali Kalighat paintings to the torqued perspectives of American Regionalism—Weaver creates whimsical paintings characterized by curving lines and juxtapositions of dense, bright color. 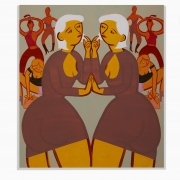 Her elastic-limbed, Mannerist figures arrange themselves before mirrors and promenade through parks, both observing and equally aware of being observed. Here, psychological narratives are suggested with an economy of expression—through the sideways tilt of a glance, the subtle curl of a lip, or the droopy slouch of a shoulder. Weaver describes her paintings as “emotional self-portraits.” These paintings are occupied with the self-conscious performativity and awkward aspirationalism of the artist’s generation, grounded in an insistent empathy with her subjects. 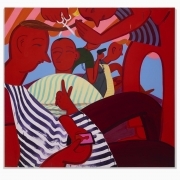 BEST LIFE features several large-scale acrylic paintings with multi-figure compositions. 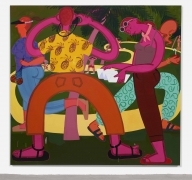 Peak season depicts eager sightseers, weary beachgoers, and a tiny beaming Segway rider—all painted in shades of hot pink and orange—as they traverse a winding footpath. Weaver tips the horizon line up past the edge of the canvas to create a compressed space of activity that unfolds entirely on the flat surface of the painting. In upkeep, the intimate atmosphere of a barbershop is thrown off-kilter by the painting’s spiraling composition. The gestural stripes of aprons and smocks worn by several of the figures amplify the lines of their rubbery limbs. Another important motif in Weaver’s work is the solitary female portrait. In a series of paintings, a single girl is caught in the midst of a mundane ritual—a girl scrutinizes her complexion, a girl arranges a snapshot-worthy lunch, a girl attempts to contour her rounded cheeks. The girls Weaver paints are not necessarily drawn from life—rather, the artist considers them archetypes of feminine self-presentation. They are pictured in once-private spaces of preparation—the kitchen, the vanity mirror—that have been made semi-public through the lens of social media, recalling the frame of the YouTube tutorial and the lifestyle blog. These paintings have a melancholy to them, suggesting a frustrated will to perfection. Grace Weaver (b. 1989, Vermont) received an MFA from Virginia Commonwealth University in 2015. Her work has been the subject of solo exhibitions in New York, NY; Burlington, VT; Berlin and Reutlingen in Germany, Glasgow, Scotland; and Chennai, India, and is featured in the collections of ­­­­FRAC des Pays de la Loire, Carquefou, France and ARoS Museum, Aarhus, Denmark. Weaver lives and works in Brooklyn, New York.